“Yamaha technologies will also help bring solo piano music to younger audiences. My career is at a point where I want to move at a faster pace. Yamaha is perfect for me right now,” Mirian Conti. Distinguished Argentine-born pianist Mirian Conti has signed as an exclusive Yamaha Artist. Conti has performed and recorded extensively throughout the world and is a highly respected performer, educator and artistic director. According to Conti, the outstanding quality of Yamaha and Bösendorfer pianos, combined with the industry-leading technology of the Disklavier reproducing piano, helped attract her to Yamaha. “The new Yamaha CFX concert grand is an outstanding piano, truly a world-class instrument that belongs on any concert stage,” states Conti. 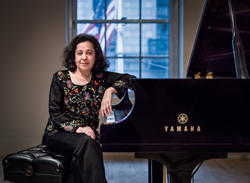 Drawn by the highly-refined technology of the Disklavier reproducing piano, Conti says she looks forward to exploring new worlds of performance and pedagogy. Conti’s multifaceted partnership with Yamaha includes a host of recording projects, which will originate at Yamaha Artist Services, Inc., as well as creative DisklavierTV™ productions, which will merge her musical art with the visual artwork of her father, Raul Conti, one of the most well-known visual artists in Argentina. The Yamaha Artist Services New York Piano Salon also will serve as the new venue for another unique collaboration: Conti’s 5 @ 5 Concert Series. This series, in its third season in 2017, will be held at 5 p.m. on Saturdays with an admission fee of $5, and the proceeds will benefit children’s charities. Each performance will showcase an exceptional pianist, as well as introduce an emerging young talented musician age 16 or under. Conti’s work is also complemented – and shaped – by a family whose artistic lineage stretches back centuries. Her father is distinguished Argentine painter and sculptor Raul Conti, whose Italian ancestry includes art critics, luthiers and conservatory directors throughout the 18th and 19th centuries. On her mother’s side, Conti hails from a family of pedagogues and writers. Her late mother, Edith Fariña Conti, was a poet of Spanish and Paraguayan descent, and her granduncle was the famous writer Eloy Fariña Nuñez. Conti’s four brothers are also highly-regarded visual artists and educators throughout Europe, North America and South America. Conti’s husband of 33 years, Richard Glasford, is an accomplished Radio/TV (cable) classical music programmer and musicologist, currently working for several web streaming services. Having graduated from The Juilliard School with B.Mus. and M.Mus. degrees, she has served on the school’s Evening Division faculty since 2007. Among her teachers is fellow Yamaha Artist Byron Janis. In recognition of her extraordinary talent, a scholarship honoring Conti was established at The Juilliard School by the Edwin Bachman Estate. She has appeared worldwide as a soloist and with many orchestras in Europe, Asia, Africa, South and Central America, Canada and throughout the United States. Conti has made solo, orchestral and chamber appearances at Alice Tully Hall, Merkin Concert Hall, Weill Recital Hall at Carnegie Hall in New York, Los Angeles’ Dorothy Chandler Pavilion, and has performed at numerous concert halls throughout the world, including the Teatro Colón in her native Argentina. She has appeared in Poland, Latvia, Morocco, Spain, France, Italy, Montenegro, Colombia, Ecuador, Mexico, and many cities throughout China. Her lecture-recitals and master classes on the music of Spain and the United States have been presented at leading colleges and universities the U.S., South America and China. She has actively organized and directed a host of competitions and festivals to promote the careers of promising young musicians. About Yamaha Artist Services New York, Inc. Since 2005, Yamaha Artist Services New York has been located in the heart of midtown Manhattan on Fifth Avenue and 54th Street, in an historical landmarked 1925 building which originally served as Aeolian Hall, the headquarters of the Aeolian Piano Company. Designed by Warren & Wetmore, the architects of other notable buildings in New York City (Grand Central Terminal, the former Steinway Hall on 57th St.,) the building later became the headquarters for Elizabeth Arden. Occupying over 4,000 square feet, the Yamaha Artist Services Piano Salon features an elegant performance venue seating up to 90 and houses a large selection of concert-ready Premium Pianos of various sizes, including the acclaimed Yamaha CF series (CFX, CF6, CF4,), Bösendorfer, and Disklavier instruments, as well as the innovative AvantGrand hybrid and TransAcoustic pianos. Led by Yamaha’s Chief Concert Technician, Yamaha Artist Services also provides outstanding technical support for concert venues and artists throughout the United States.